Air travel with a competition sword? 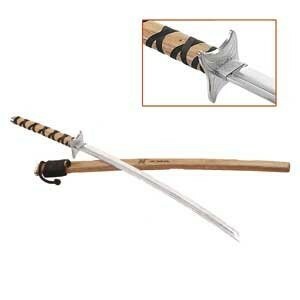 I recently changed my competitive weapon of choice in my martial art (TKD) to a Gum Do, or sword. The sword is basically katana sized, unsharpened but it does have a point, as seen below (Although my scabbard and hilt are black). I also compete with a three sectional staff, which is rounded and foam covered. My thought was to get a rifle travel case, and hollow out the foam slightly to accommodate both weapons, and the mini sound system that I use for the creative divisions. Is there any rule about using a firearm case for other than firearms? How likely is it that this would get stolen, or do you have to go to a special place to pick up those cases? I did exactly this - put competition swords in a firearm case and check it as baggage - when travelling through the US, Hong Kong, and China a few years ago. It's completely legal, as long as you aren't violating local weapons laws regarding personal carrying at any point, and isn't a violation of terms of carriage for any airline I'm aware of, as long as you don't do something silly like try to bring them on as a carry on. I went through the nothing to declare line everywhere. TSA will ask you whether it's a firearm, and probably want to immediately x-ray your bag. At HK customs they stopped me briefly so they could have a dog sniff the container. The only problem I had was disembarking at ORD where two baggage handlers (not any kind of security or authority figures, just some wankers who wanted to feel important) gave me grief about using a rifle case. Nobody anywhere cared about the swords. I did need to go pick up the bag at the oversize counter in the US, even though it wasn't oversize. They didn't care in Asia. Just pack things nicely and check your bag. It shouldn't be a problem, but a nondescript black case will attract less attention than the camo affair I used. A case is just a case at the end of the day. Is there any rule about using a firearm case for other than firearms? A firearm case without the firearm is just a case. Put anything you want in it. Swords of any description are fine in checked baggage, airport security sees knives, spears, arrows and various other pointy things daily, it won't surprise them at all. Mind how you pack this one. Boxes with wires and batteries can often look like bombs on an x-ray. Boxes in one corner, neatly wrapped wires in another, and batteries in a 3rd corner will look much better. It will likely be treated as a weapon, enhanced by the fact that you are packing it in a gun case. Weapons are handled with a bit more care and are delivered at the end point either by hand or at a different baggage claim (often at the oversized claim door). For the case itself, I would get a custom made Pelican case (just google it). They are sturdy, safe, lockable, come with foam padding. In any case, contact the airline you wish to travel with and make certain they are aware you will be carrying weapons at the airport and will be checking them in properly. Also be prepared to get at the airport earlier than used to. Not the answer you're looking for? Browse other questions tagged air-travel safety airport-security or ask your own question. What does it mean to “prep food on the go” in terms of air travel?